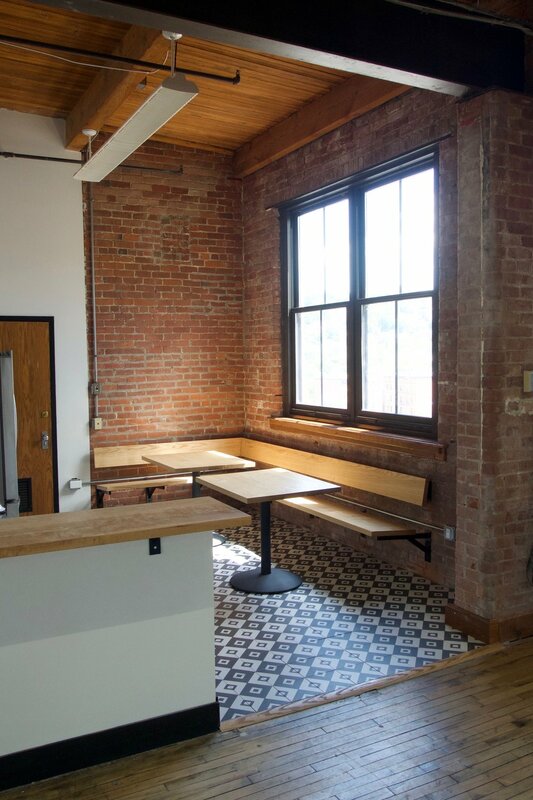 Phase one of the renovation of this historic warehouse turned co-working space was the introduction of a small kitchen. Acting as part food prep and part alternative productive space, the kitchenette lends itself to more than the typical office dining area. The cafe-style feel is provided by sixteen feet of floating banquette seating and table space enough for several people to work over lunch simultaneously. The cantilevered bar top allows for others to sit independently, creating alternative seating and a change of environment in the typical office setting. Simple shelving was added for personal and collective storage, giving the area an approachable feel. Each element was custom fabricated from locally sourced ash wood and steel in house. Exposed hardware was chosen to reflect the industrial nature of the surrounding space. The interesting grain character and light coloration of ash wood compliments existing exposed wooden beams and oak flooring, while contrasts the black powder coated steel.